Oh, yeah. 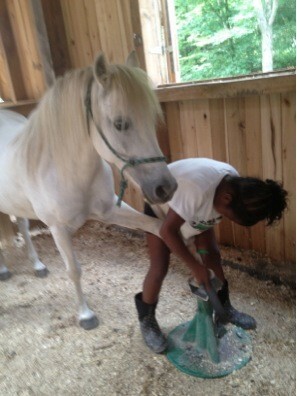 We may be kids, but we take care of our own horses. 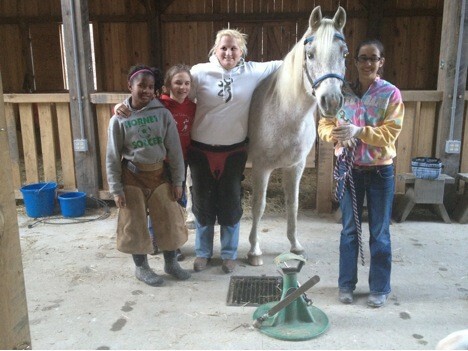 Meet the girls of my 4H Club, the High Riders, who are learning to trim their own horses. 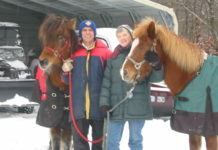 This is our group at our barn with my Mom’s horse, Reighny. Mom is one of our Club leaders and she is a professional barefoot trimmer. These kids and their horses are her clients and the girls are going to learn to trim this year. I have already been trimming since last year. On my Mom’s Facebook page, this picture of me trimming Nanny got the most hits of any other post. I was only 11 then, and Nanny was a great pony for me to learn on. So let’s see who we are: This is me, Nonee. I’m 12. I’m getting ready to finish off a mustang roll. That’s Mikayla holding. This is Kodi. She’s 16. 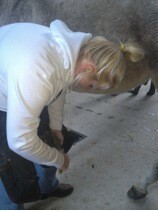 She is picking out a hoof. I’ll get a better picture of her next time, sorry Kodi. This is Mikayla. She’s 14. She is getting ready to rasp a hind foot. Her mom Wendy is in the background holding. This is Ashlee. She’s 14. She is getting ready to finish a mustang roll, too. Thanks Reighny. Mom wanted to get some pictures of all of us together, so we used Reighny as our pretend trim model horse. he was great. We have lots to learn and practice. This is Kodi and Zippo he is part quarter horse. 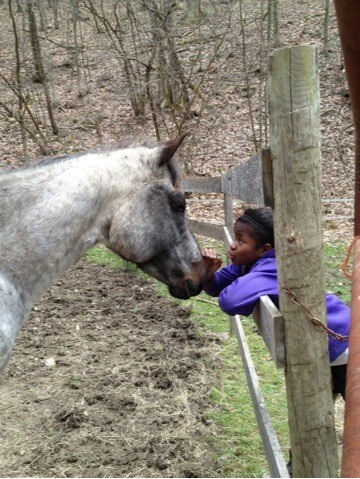 Kodi absolutely loves this horse. He used to wear shoes and have long toes, but now he is doing pretty well barefoot and in boots. He has flat feet and needs to be trimmed regularly. Kodi will be learning to roll and bring back his toe. Mom will still be helping to stimulate the back of his foot. Kodi’s favorite Easycare boot is the Glove. This is Mikayla and Bug. Bug is a quarter horse. She has taught many kids in our county how to ride. She is just such a nice horse. 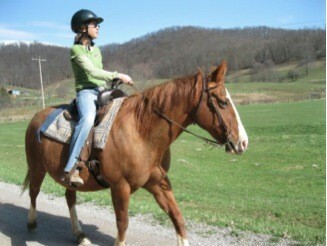 Before Mikayla got her, she was a barrel horse, a trail horse, a brood mare, a lesson horse. She too wore shoes most of her life. She is 21 now and has a possible diagnosis of early navicular. By keeping her toes short and supporting the back of her foot similar to Kodi’s horse, Bug is doing great. She is on some supplements for arthritis and joint health. Bug wears boots when ridden and does great. Mikayla started learning to roll toes and pull back breakover last year. She hopes to be Bug’s primary trimmer within the next year. 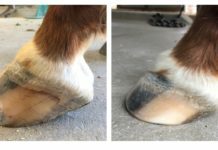 Mikayla’s favorite Easycare hoof boot is the Edge. This is Ashlee with Sasha. Sasha is a quarter horse x Arabian. They are new to one another. Sasha, 16, was a rescued horse we took in a year and a half ago. We easily found her a new home with a friend. Unfortunately, this friend, who loved her, has had a life change and so Sasha has come back to us. We are actually pretty excited because she is such a nice mare. She has nearly perfect feet and does not need frequent trimming. 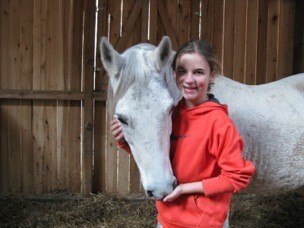 She and Ashlee will get to know one another and Ashlee will use her as her project horse this 4H year. Sasha does not need booted, but if she ever does, Ashlee’s favorite Easyboot is the Glove Back Country. Finally, this is Bella and me from last spring. Bella, 5, was also rescued, originally by a woman in Virginia from a PMU farm in Canada. We got her when she was two. Mom helps me more with her feet than with Nanny’s because she has some whole body balance issues that are reflected in her feet. 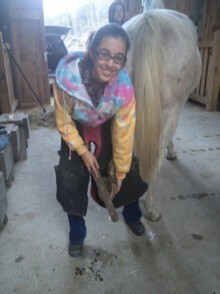 We are also working with an equine dentist and body worker to help balance her better. 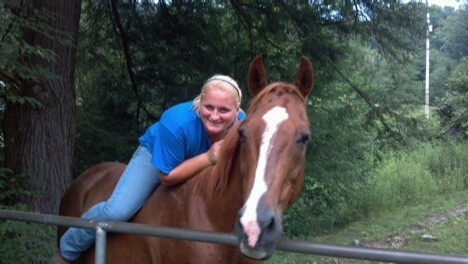 I really love this horse. 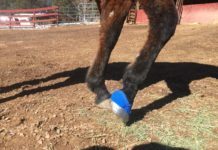 My favorite EasyCare hoof boot is also the Glove Back Country. 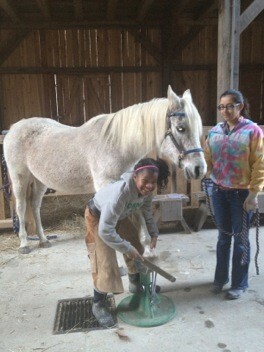 So, that is us, the hoof trimming team from the High Riders 4H Club. 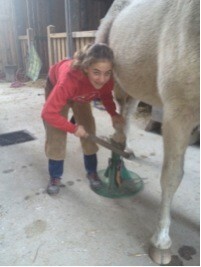 We are determined to be responsible for our own horse care, including learning to trim them properly. If anyone reading this would like to help out a great group of girls, we are in need of some more basic trimming supplies, such as chaps, rasps, and a hoof stand or two. My mom is providing everything now. Eventually, we will learn to use hoof knives and nippers, but only I am starting to use them at this point and I can always use Mom’s. 4H is a registered non-profit and we can provide a tax letter to you if you would like to donate any of these items to our Club. Thank you for considering.